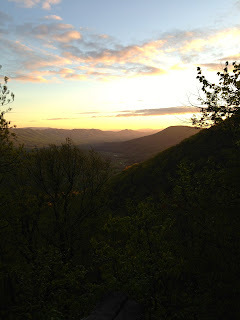 Somewhere along the way this spring I came up with the brilliant idea of running to McAfee's Knob to watch the sunrise. Silly. Who would do such a thing? 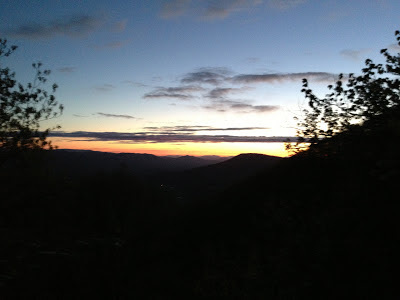 For some, being up before the sun is bad enough but trying to run 4 miles on a semi-technical trail by headlight while gaining roughly 2000ft. most would consider to be just plain stupid. Perfect. I'm in! I considered doing this particular run a couple times earlier this spring but decided to forgo my plans because of impending weather. Upon checking the forecast for Sunday morning, I decided the weather was going to be perfect and let Michelle know my plan. 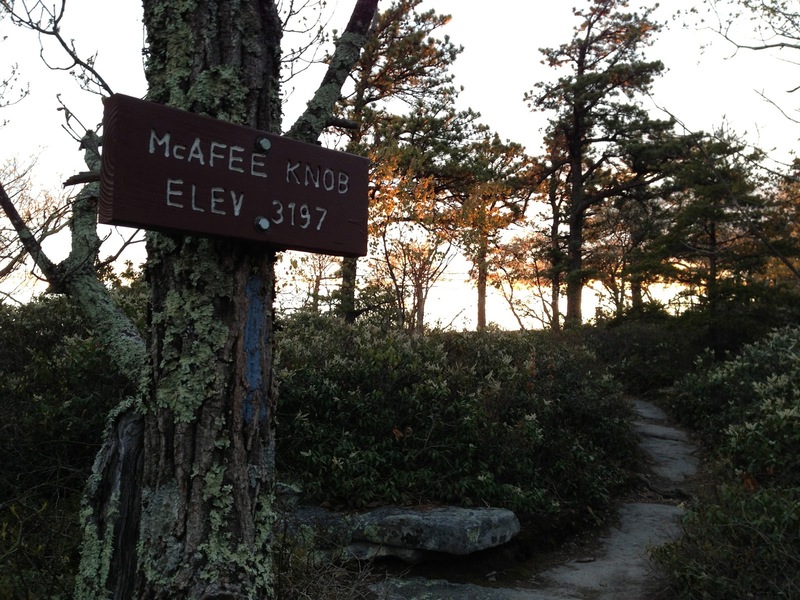 If you're not familiar, McAfee's Knob is the most photographed location on the AT (Appalachian Trail) and is a popular hike for Virginia Tech students as well as folks in the New River Valley region. I have probably done the hike close to 10 times in my time at Tech but not since Michelle and I hiked it in August of 2009...so it had been awhile. 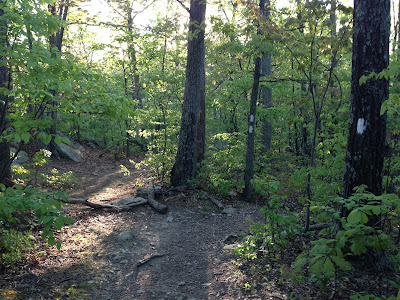 I remembered some of the details of the hike but perhaps doing it more recently...in the daylight...would have made things go smoother on Sunday morning. 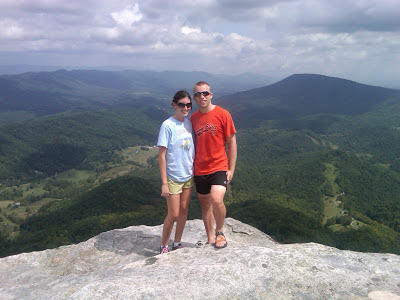 Michelle and I circa 2009 at McAfee's Knob (rocking some JOH tan lines!). My alarm went off at 4:05 Sunday morning. Silly early. I grabbed my stuff, which I had laid out Saturday evening, including my hydration pack with Gorillapod and was out the door by 4:15. 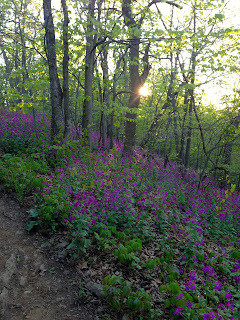 When I checked the weather Saturday evening, the predicted sunrise time for Salem was 6:22AM which gave me roughly an hour to make the short trek up to the top from the trail entrance. 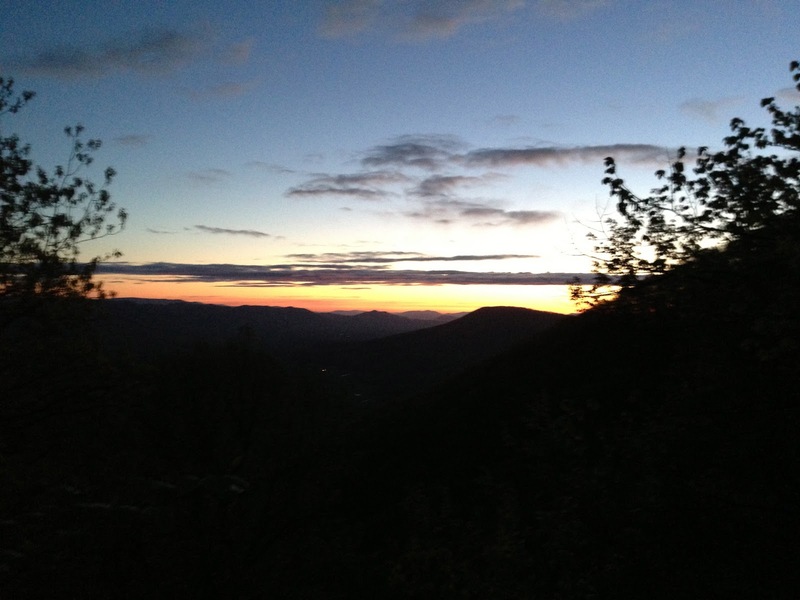 The drive takes about 40 minutes (Google says 37) in the daylight and slightly more...well...when the suns not up. 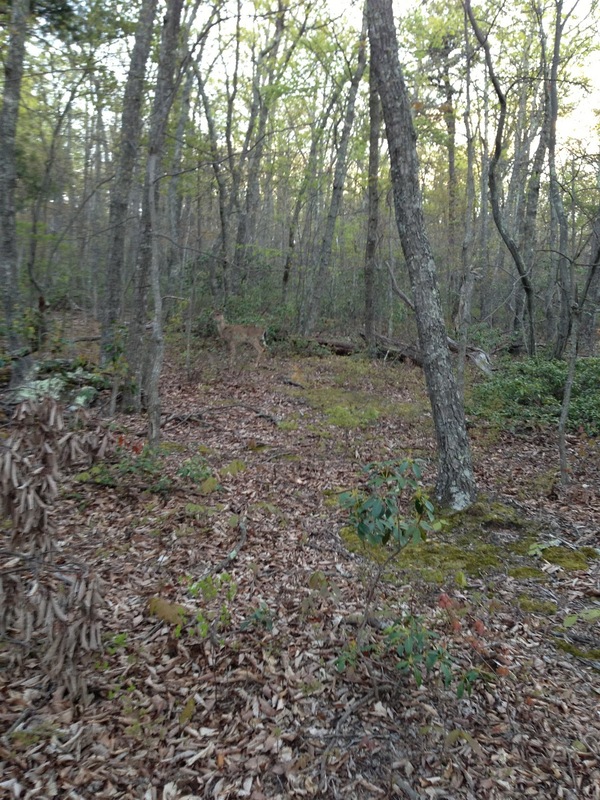 Lots of critters were out and about including a deer I saw crossing the road no more then a mile from my apartment. 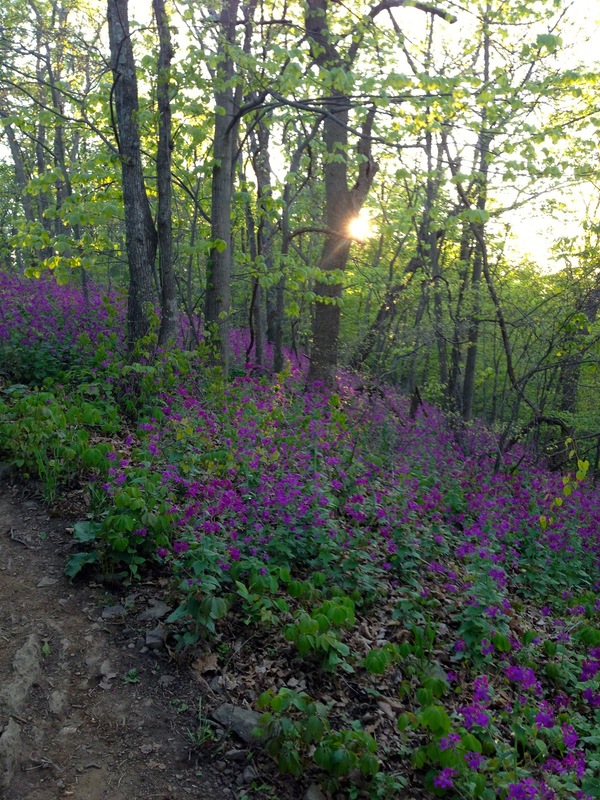 Once at the trail head, I put on my trail shoes grabbed my hydration vest and headlamp and went looking for the trail entrance. This was the first indication of HOW dark it really was. I had a good idea of where the trail head was but it had been almost four years...and well it was pretty freaking dark. 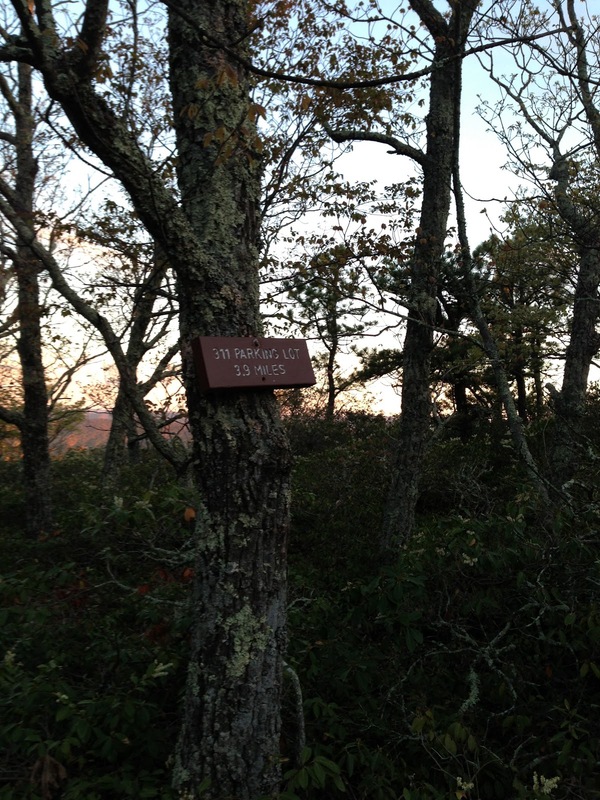 I managed to find the trail head and started up the trail, stopping after about 400ft. when I decided my headlamp was NOT going to cut it for light. I downloaded the Flashlight app. for my iPhone which uses the LED light (that is part of the camera) to provide an additional light source. The LED on my phone was WAY brighter than my headlamp, although I believe the batteries in my headlamp may be close to the end of their life, but the combination of the two provided adequate lighting for the run hike. 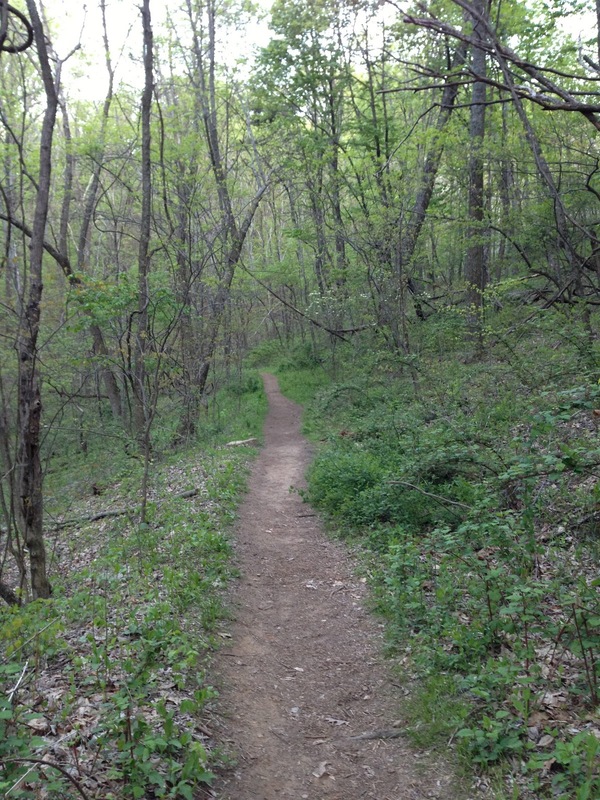 I managed to make what I thought was pretty good time at the start of the run and eventually found myself on a section of flat trail..."flat trail? I don't remember any flat trail?" 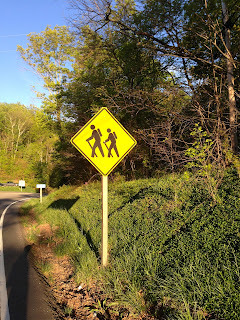 I back tracked a few hundred feet and found a sign that directed to the AT and 311 and headed back up the trail I had just come down. 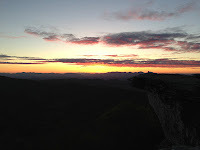 I was worried I would make it to the top right after the sun had come over the horizon because of backtracking so I picked up the pace and pushed it. I hauled it on the downhill trying to make up time I had lost until I hit the road..."the road? Oh Sh*t!" I had managed to come all the way back to the parking lot where I started and had blown 20 minutes. Bummer. I considered calling it quits at this point with the poor lighting and doubting that I would actually make it to the top before the sunrise began. I decided to give it another shot. Now warmed up, I headed back up the trail and past the guys tent I had now run by three times (poor guy), I didn't even notice it was the same tent the second time, and managed to find the intersection I had blown through initially and missed once I had turned around. Now knowing that I was on the right trail, I did my best to push the pace and eventually began to remember sections of the trail as I came to them. First, all of the bridges and then crossing over the fire road that takes you out to 311. 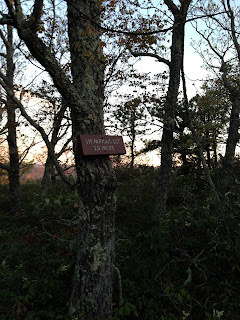 Eventually, I made it to the section where there are campsites and a shelter and lost the trail for a few minutes and had to backtrack through the campsites until I found the sign I had missed. The run was turning into "disturbing campers along the AT." Around 5:45 there was enough light out that I turned off my iPhone for the last 15 minutes or so. The view on the way up. 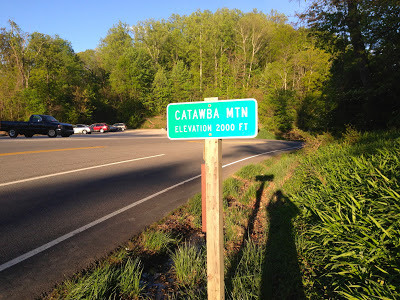 I hit the last intersection where you make a left, about a half-mile from the top, near the massive boulders and realized it was just another few minutes and pushed until I reached the overlook. It wasn't super fast and involved both running and walking but still a decent clip. 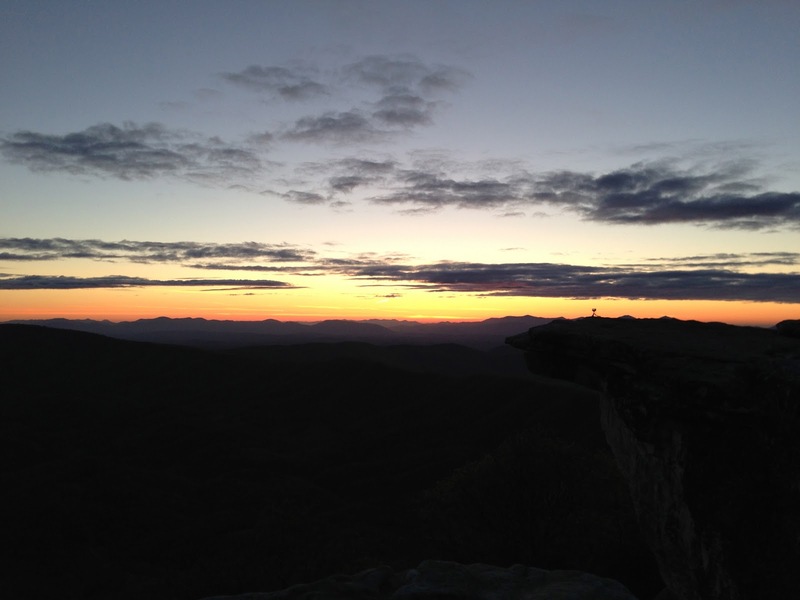 Once at the top, I snapped a couple quick photos including the panoramic below with my phone...and then realized I wasn't at McAfee's Knob but another overlook..."what? where is it?" 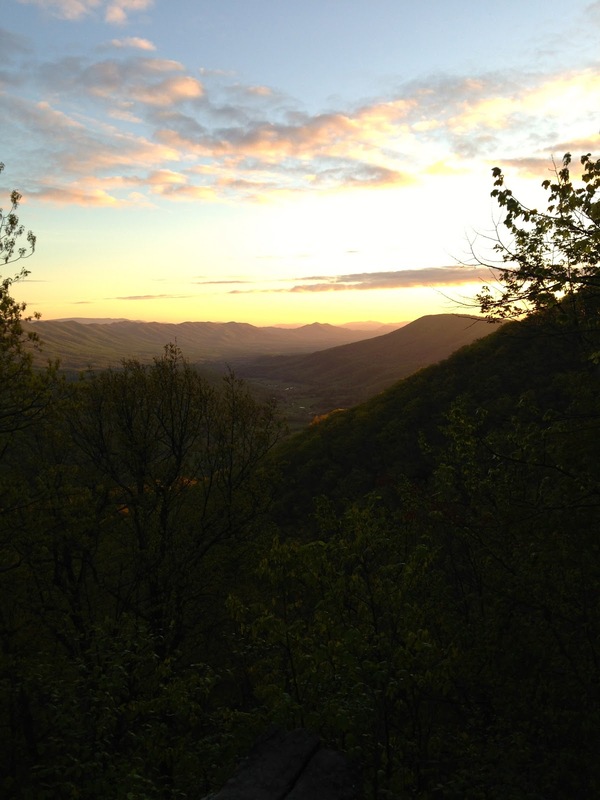 The first (wrong) overlook, just past the knob. I went back out to the trail and looked both directions to determine where I was. 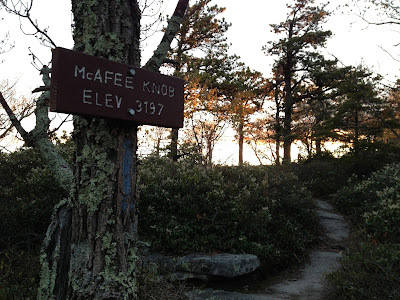 I went left but quickly realized I shouldn't be going downhill and turned around running past the overlook I had just been at and found the small sign that said McAfee's Knob Elev. 3197. I took my eyes off the trail for a split second to read the sign and ate it. Hard. 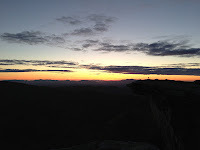 There were a few expletives, mainly because I was running with my camera/Gorillapod in hand (thank goodness it's shockproof), but I eventually picked myself up and walked up to the Knob where I found a couple who were waiting for the sunrise as well. You can see the color on the clouds change. Just as the sun peaks over the horizon. I made. And it was totally worth it. The wind was brutal and having worked up a decent sweat on the way up I got cold quick. I used the Gorillapod and setup my camera to record the sunrise and started up a conversation with the folks who were there and had made the trip up from Chapel Hill. They had camped, wise choice, and brought their sleeping bags to the top, also a wise choice. I was a bit envious and considered asking to share with them but thought it might be weird. I tried to stay warm but the wind made it impossible so I paced waiting for the sun to come up. Unfortunately, the battery on my camera died about two minutes before the sun came over the horizon right around the predicted 6:22AM. I was able to record the rest of the sunrise on my phone, hence the different in exposure, and put the two videos together below, boring but proof I was there. I didn't stay for long, maybe 20 minutes maximum, as I could really feel the effects of my body temperature dropping and my hands were going numb (read: I couldn't use my phone). As I was leaving, I snagged a photo of the very small sign for the knob that I blew past on my way up...pretty small right? Really like how the sun was hitting the trees in this photo. A sign right next to the one above that claimed the parking lot was 3.9 miles. The way down was fast and more relaxed because I could actually see where I was going. I noticed I was pretty tired though as I nearly hit the deck several times but managed to return home all teeth intact. I did take a few photos on the way down because the light allowed for it. I saw this guy (girl?) on the way down who gave me a "what are you doing here so early?" look. 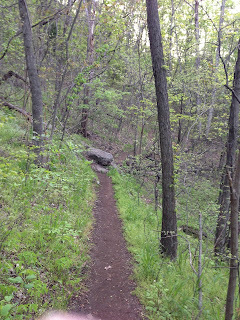 Not all of the trail was super technical but all of it was gorgeous! These flowers line a lot of the trail. 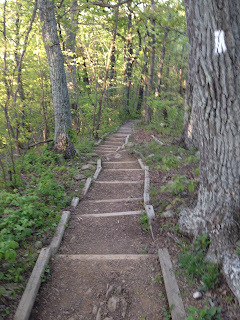 So as I mentioned above, I did some back tracking during the first part of the hike up to McAfee's Knob which should have been just over 4 miles but ended up being closer to 5.5. Below is the trail I was looking for but the sign you see is actually about 50 feet after the intersection, which in the dark was WAY further than I was looking for off the side of the trail. 3.4 miles from the top according to the sign. Below is the actual intersection about 50 feet up the trail from the photo above. I initially went to the left over the logs but should have gone right. You can see the double white blazes on the small tree near the middle of the photo which marks the intersection. 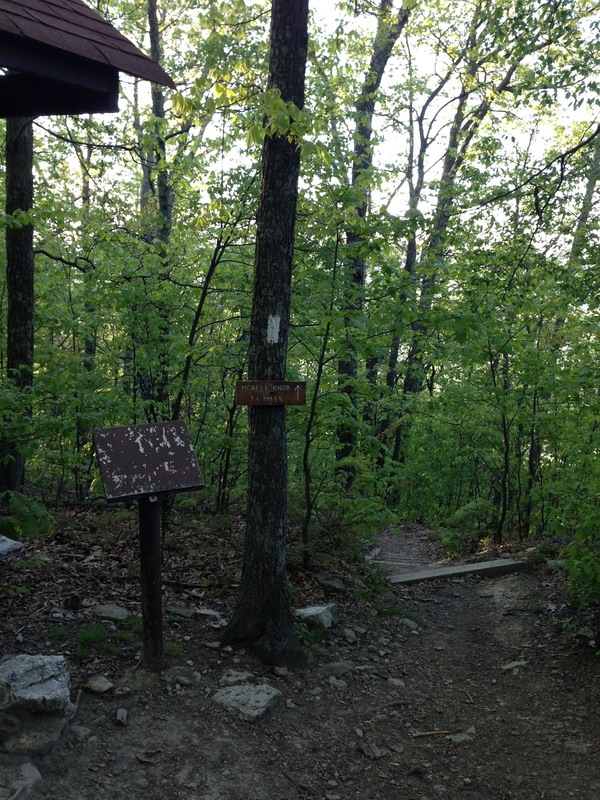 The sign in the photo above is where I finally went right after covering the trail for the third time Sunday morning. So you can see how in the dark it was easy to miss. 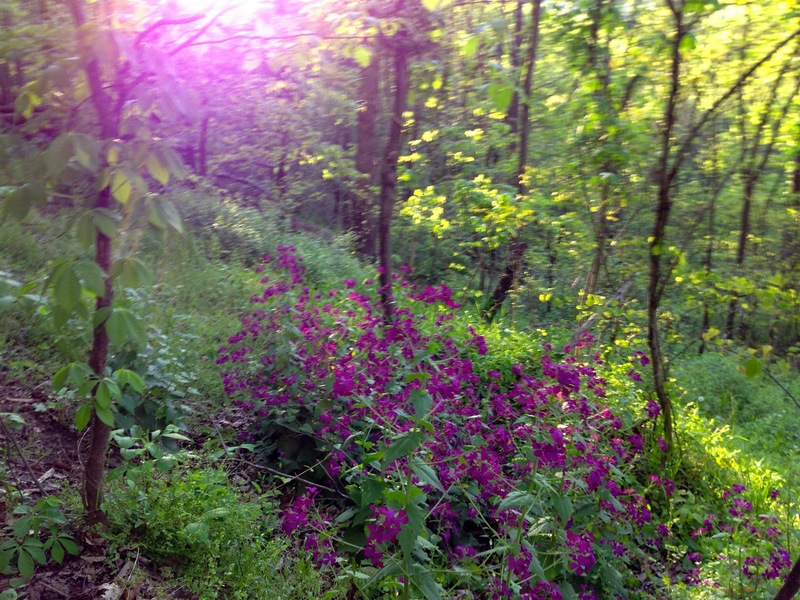 More of the gorgeous flowers on the way down. This section of the trail gets a lot of traffic hence the stairs and developed trail. The sign I saw (unfortunately) three times Sunday morning. I got back to the parking lot around 7:15 and had a chat with the guy who was camped right off the trail who's tent I ran by three times earlier in the morning. 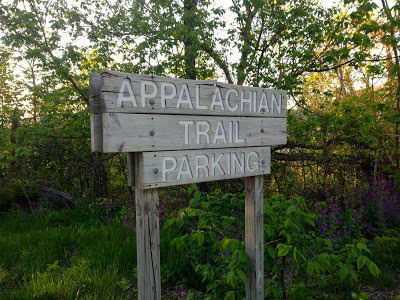 311 McAfee's Knob parking lot. It was a gorgeous morning for a run! Next time, I will either use a different headlamp or an additional light that is not my phone. The one thing I forgot was my Garmin watch so I recorded the run using the Strava Run iPhone app. which worked out pretty well. 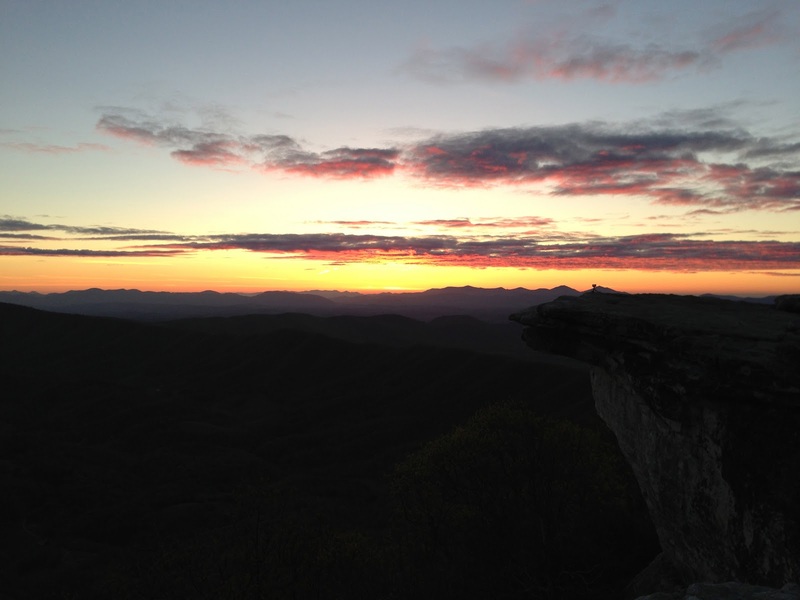 Posted by Unknown at 5:48 AM I'm reading from MyDailyGround: Sunrise "Run" to McAfee's Knob Tweet this!